Our budgies, Chip and Senu have been with us for a whole year now. Still, we still haven't hand tamed them yet. Both birds seem to only play with the hand, and no matter what we do, such as distracting them with toys, they still play with it anyways. Is there anyone who can help us? By the way, we have attached an image of Senu playing with a hand to make things clearer. It appears your budgie is willing to step up on your hand. What is it that you want to achieve with regarding to training? Have you read the stickies at the top of the Taming and Bonding section of the forum? Are you using positive reinforcement? Chip feeds the hand, and sometimes it even starts to "mate" with it. Senu is now used to play with the hand and sees it as a toy. She gained enough trust with it that now she starts to bite hard. I don't think they want to step up. And to add, if the hand gets too close, they run away, and if you do it enough times, Senu just starts to play with the hand and Chip, well, doing his thing. 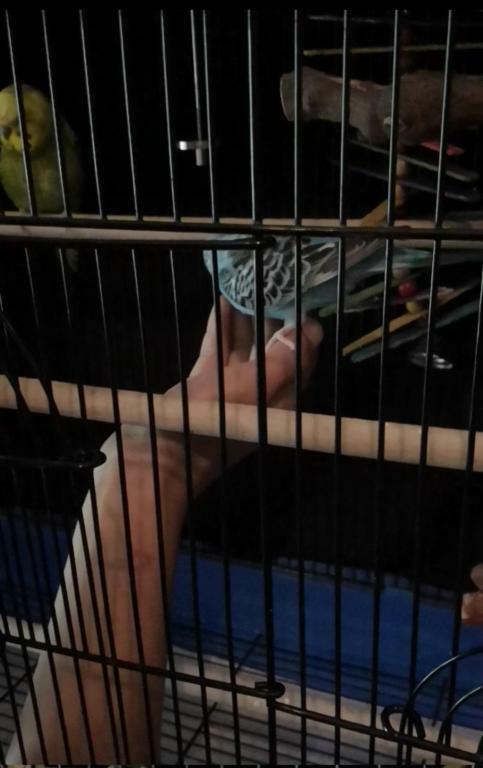 Are you trying to get the budgies to step up in or out of the cage? Are you using a food treat to entice them to step up? Have you read the stickies regarding training?